The more we learn about libraries the more we recognize their importance and their need for help from all the library lovers everywhere. Did you know the American Library Association has all sorts of tools so that anyone can get involved? We put together some resources to help understand what ALA Virtual Legislative Day is all about, we invite you to stand up and speak up for your library! 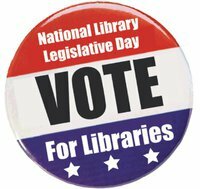 "Virtual Library Legislative Day is part of the American Library Association’s (ALA) National Library Legislative Day on May 10, when hundreds of library advocates will descend on Capitol Hill to meet with members of Congress and their staffs. Library advocates who cannot make it to Capitol Hill for the event can still be a part of the effort by calling and/or e-mailing their elected officials on May 10 – or any time the week of May 9-13." ALA Legislative Action Center --how to find your elected officials and more, click here. @YourLibrary, the Campaign for American Libraries provided wonderful resources and explanations, get started. Young Adult Library Services (YALSA) created a wiki and a great list of talking points --know your stuff! Teens and Libraries: Action Items for 2011 Library Legislative Day and talking points, click here. YALSA's Wiki, loads of interesting info, click here. Need inspiration? Read about the amazing letters to children about library love from Dr. Seuss, E.B. White and so many more, click here.